When it comes to seafood especially fish, I like to secure the fresh kind. Maybe, it’s because I’m from an island domain where there is continuous access to fresh seafood on a daily basis. Moreover, my dear uncle was a fisherman in his village in St. Elizabeth, Jamaica. Looking back, I realize how blessed and rich I was to actually reap my omega foods from the source. In fact, later on as an adult life I was fortunate to be able to purchase fish as soon as the fishermen came to shore with their catch. So, a couple of day ago when I went shopping to replenish my food supplies as I grabbed a few frozen spinach packets I was drawn to the fish section. 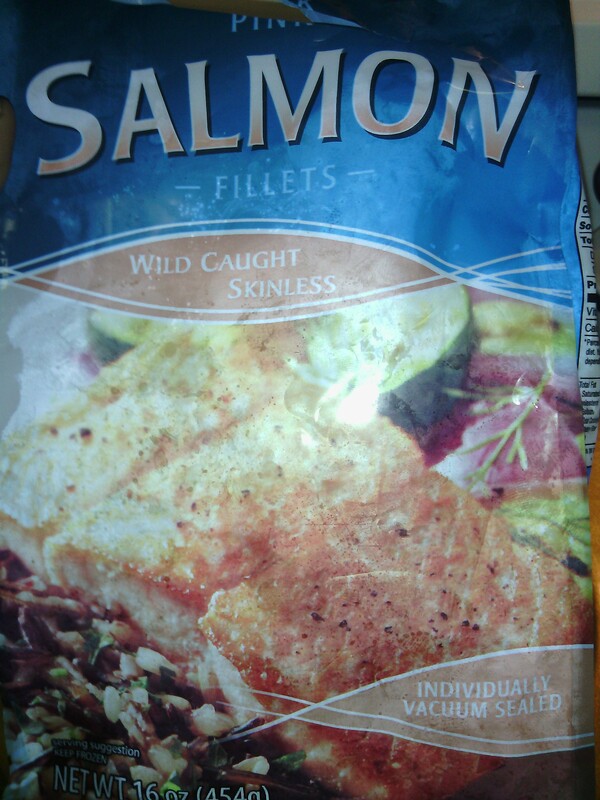 The shiny packet said frozen wild salmon. On close inspection it showed that the bag contain four sealed fillet pieces. Moreover, it was on sale. The ego in me questioned, “why a sale? Is it fresh?” I was about to continue my shopping but, I had a change of heart and fetch a package. When I brought home the fish I decided to defrost a couple of the fillets overnight. I wasn’t too enthused to see the residual water left on the plate. But, on the other hand, I was happy to note that they weren’t smelling fishy. I rinsed and dried the pieces, seasoned with salt and pepper along with a little crushed garlic. In a hot skillet, I drizzled olive oil and seared fish after I removed the garlic and added a light dusting of bread crumbs. After a few minutes on each side, my fish immediately came alive with a beautiful crust. I set aside and added an additional drizzle of oil to pan along with a pat of butter. I did a quick pan roast of onions, red bell peppers, tomatoes, and garlic. And because I know that fish love acid I added a squeeze of fresh lemon juice as well as a few chopped olives and capers. 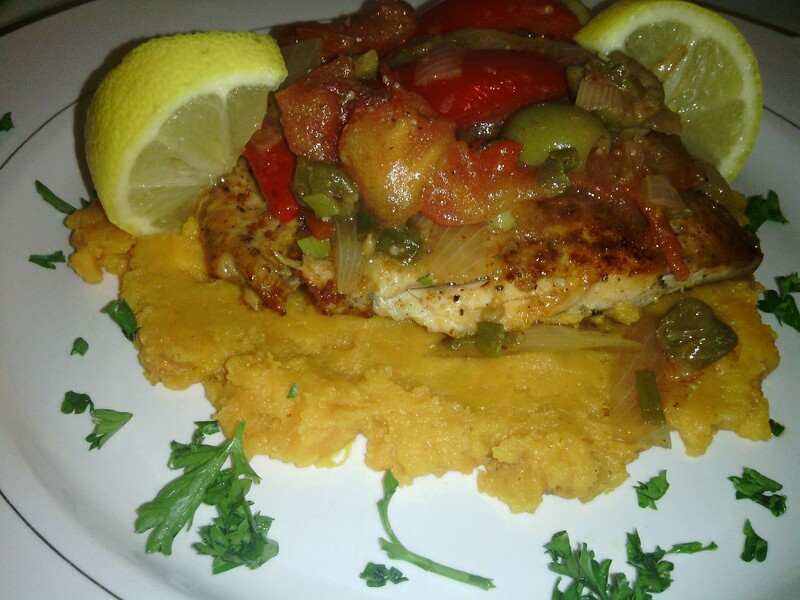 Fish was served on a bed of smashed sweet potatoes with a dollop of sour cream and a sprinkle of cinnamon. I then added pan roasted veggies as topping with fresh lemon and parsley as garnish. The combination was amazing. The savory and sweet were just what the dish needed. I was pleasantly satisfied with my frozen wild salmon dish. I was happy.